There is a large risk of you falling down these stairs. 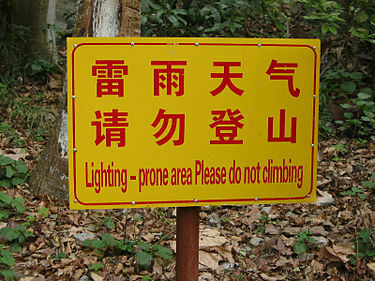 Which is meant to say "(When there are) thunderstorms, please do not climb the mountain". Bad translations are usually the result of using automated translation apps like Google Translate or Babelfish. I figured that in a few years time these apps will be so good that they won't be able to be used for producing terrible translations, so I made this Engrish generator. Engrish tends to be the most common in East Asian countries, probably because of the huge difference between Asian languages and English in terms of word order, sentence structure, and word meanings. 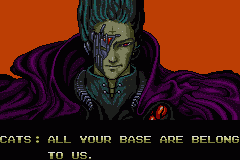 One of the first entrances of Engrish to popular English culture was with the Japanes game "Zerowing" where, at one point, a character remarks "all you base are belong to us", meaning to say something like "All of your base belongs to us now." This fine example of bad translation spread throughout the gaming community and eventually culminated in the wildly popular meme. The Engrish text was a sincere attempt to convey information of English-speaking customers. The Engrish text was simply used for aesthetic purposes and was not intended to be read by English-speakers. The latter point is somewhat common in English-speaking countries too where meaningless French phrases are printed on t-shirts, or Japanese and Chinese characters printed on products to give them an "oriental" feeling. In almost all cases, a bad translator was used to generate the text, but the intentions can vary. The use of different languages in marketing has even prompted studies Engrish-style translations and international marketing. If you're an English speaker that commonly watches anime series, you've probably gotten used to intros that go something like this (it's a South Park parody song). Thanks for using my translator, and if you've got any ideas for how it could be improved, please comment below!